January 5, 2017 — Belfast, ME — East Coast Yacht Sales has announced that they have opened their sixth brokerage office in Front Street Shipyard in Belfast, Maine. With growing market share and a need for water access, this move will bolster East Coast Yacht Sales’ mid-coast Maine presence while supporting the diverse client base of Front Street Shipyard. East Coast Yacht Sales opened in 1986 in Yarmouth, Maine, and is owned by Jon Knowles. Enjoying over 30 years in business, East Coast Yachts Sales has strategically placed offices along the New England coastline. Employing some of the yachting industry’s top yacht sales professionals, ECYS represents prestigious brands like MJM, American Tug, J/Boats and Vanquish as well as quality brokerage listings. 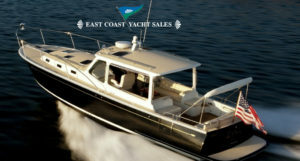 For more information about East Coast Yacht Sales please visit www.ecys.com. Front Street Shipyard is an international boatbuilding, repair and service facility in Belfast, Maine, which offers dockage, repairs and winter storage for boats up to 200 feet and hauling capacity for vessels up to 485 tons. The yard has deep-water access for a range of power and sailing vessels from small boats to superyachts. With services from engine and systems maintenance to carpentry and advanced composite repair work, Front Street Shipyard is the most-capable full-service facility in the northeastern United States. More information about Front Street Shipyard is online at www.frontstreetshipyard.com.